Marriage can turn into a score-keeping battle of wins and losses. Like it or not, conflict happens in every relationship. It’s coming your way. And while it’s true that there’s no controlling whether conflict happens, you can control what you will do when it shows up. The Bible gives us some powerful principles that can heal a broken marriage. It gives us a roadmap that will keep a strong marriage strong, and make it stronger. They are a call to commitment—to promises. I refer to them as the “I Do” Promises. Try them on for size and see if they just might rehabilitate the most precious relationship in your life. 1. I PROMISE TO BUILD AND NOT BREAK. In conflict, there are war-tactics and there are peace-making tactics. Which you choose will determine whether you win or lose in the end. You can insist on winning the battle, but you’re going to lose the war. Here’s the delusion: we think by winning the little conflict, we’ll prevent ourselves from losing the herculean struggle. Often, we win the little hill and lose the mountain range. Insist on coming out on top of daily arguments and you’ll forfeit the life-long objective of love. We have to make the promise to our spouse—to ourselves—that we will build and not break in our marriage. 2. I PROMISE TO FOCUS ON THE GOOD AND NOT THE BAD. There’s a gap in every relationship. It’s the gap between what you expected was going to happen, and what actually happens: reality. Some of you like it when your spouse screws up because you see your chance to be right. You love to believe the worst, just so you can win. But couples who stay in love for the long haul have made it a habit to assume the best about each other. They are generous in their assumptions. …Whatever is true, whatever is noble, whatever is right, whatever is pure, whatever is lovely, whatever is admirable—if anything is excellent or praiseworthy—think about such things. This isn’t about deluding yourself that you married the perfect person. Of course you didn’t. But hey! They married an imperfect person too: YOU! You don’t have to pretend there’s nothing ever wrong in your relationship. Just choose to focus on the good instead. 3. I PROMISE TO TALK AND NOT WALK. Communicate. Don’t evacuate. Focus on restoring the relationship. Don’t just walk off or run away. If you get so angry that you shut down, stop talking and take off, you need to know you’re in dangerous territory. When you harbor resentment and refuse to reconcile, you are giving bitterness permission to wire your relationship with explosives and handing it the detonator. Promise to talk and not walk. 4. I PROMISE TO GIVE AND NOT TAKE. Establish a “NO-BULLY-ZONE” in your marriage. We have them in schools. Why not put one in your house? When you have conflict with your spouse, make sure neither of you ever leave the discussion feeling as though you’ve lost. Admit your own desire to be right and commit to never bullying your spouse into submission. Taking conflict to that level will destroy your relationship. Love isn’t about pulling someone up to be where you are. It’s about climbing down off your high horse, descending beneath your loved one and lifting them above you. Love is about believing, not belittling. It’s about giving not taking. Love is kind and patient, never jealous, boastful, proud, or rude. Love isn’t selfish or quick tempered. It doesn’t keep a record of wrongs that others do. Love rejoices in the truth, but not in evil. Love is always supportive, loyal, hopeful, and trusting. Love never fails! You have a choice today: You can fight to win… and lose. Or you can choose to fight right… and win. Pour grace on your spouse. Extend forgiveness. Give of yourself. The “I Do” Promises will rehabilitate what is broken. They will reconcile your relationship. They have the power to rebuild your love. 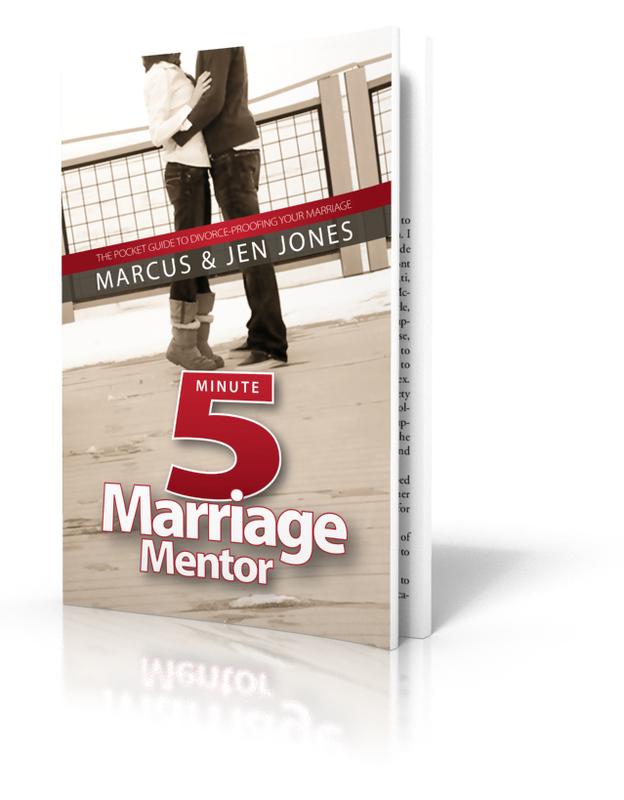 Subscribe to MarcusJonesDirect.com and receive the brand new e-book from Marcus and Jen Jones, “The Five-Minute Marriage Mentor: the Pocket-Guide to Divorce-Proofing Your Marriage,” ABSOLUTELY FREE. A lot of people I know are miserable in their marriage. Love didn’t turn out they way they’d hoped. Ever been there? There is a marriage fantasy that many of us buy into at one point or another: we actually think we’re a living, breathing Disney movie. Every guy thinks he’s a prince. Every woman thinks she’s a princess. In the theatrical release of our relationship, there’s usually an evil stepmother in the mix. But we hold on to hope that if the dragon can be slain, and the love song plays at just the right moment, the prince and the princess will fall madly in love and everyone will live happily ever after. But real life doesn’t work that way (unless you really DO have an evil stepmother or a pet dragon). Our marriage can become deeply broken. The dream can be shattered into a million pieces. And we’re left regretting having spent money on the Disney ticket. Our marriage needs rehabilitating in a real-world way. 1. SEEK OUT SOMETHING NEW. Somewhere between 40-50% of marriages end in divorce, and many more that stay together are just miserable. I’ve had plenty of couples tell me in desperation that they just want out—they want a new marriage. Maybe you’ve said those very words. I’m going to tell you something pretty scandalous today: You DO need a new marriage! (You just don’t need a new spouse in order to get one.) A new marriage is possible without having to get a new husband or wife. It starts with seeking out something new: a new outlook, a new commitment, a new perspective on the differences that have built such a wall between you. Some of us we simply need to rediscover the value of our spouse. Remember when you were dating? Remember when he was funny, not annoying? When she was persistent, not a nag? When he was smart, not a know it all? Go back to where you started and start expressing encouragement in those things. Because let’s face it, if you are not encouraging your spouse, you’re probably discouraging them. I hate being wrong; I hate to lose. Ask anybody. But I’ve learned the hard way that when I insist on my own victory and make it all about MY win, I actually end up losing. But when I choose to lose – when I help my spouse win, or my kids win—I end up winning right along with them. Think of your marriage as a team sport—not an individual one. My team is my wife and four kids. I have to ask myself, “What do they need to win?” One of the most spectacular plays in all of sports is baseball’s sacrifice bunt. Sometimes the winning choice is to choose to lose. When you take from someone, it drives them away from you. 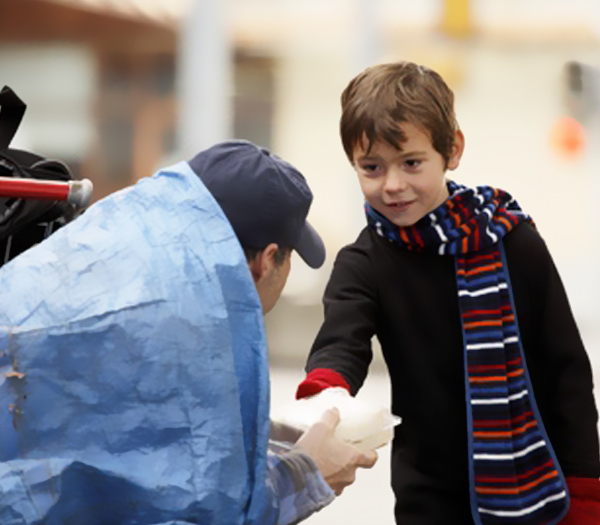 When you give to them—selflessly—it draws them toward you. That’s just how it is. I don’t think we look at our wedding rings often enough. Those little bands have a tendency to become an overlooked part of our hand. But we should pay more attention I think. Wedding rings are a reminder that this marriage thing is not about you. It’s about loving them. So give selflessly. 5. DECIDE TO BEGIN AGAIN. What is the worst sin a marriage can suffer? It’s not what you think. It’s unforgiveness. When you hold on to your hurt, you perpetuate the pain. Beginning again isn’t easy. I’m not pretending that it is. But believe me, unforgiveness is a toxin that will end your marriage even if you never file the papers. Set your self free. Forgive. You can’t fix the problems if you’re trying to fix the blame. Make the commitment now. Make the five decisions that will begin rehabilitating your relationship. I grew up in a great home, the oldest of three Jones boys. My dad was a pastor, my mom a school teacher. We didn’t have much in the early years, but I never knew the difference. We had enough. Our needs were met. Our relationships were rich. We had each other. My father’s life loomed large in our home and I looked up to him in more ways than one. I suppose that’s normal for a young boy to idolize his dad. I loved mom, of course, but dad…he was something. In my case, Pop represented the epitome of strength and boldness. He was the definition of what I thought it meant to be man. He was a leader who modeled integrity. He was a Christian who walked with God. He was the guy who showed me how to shoot a gun and use a pocket knife and clean a fish—you know, all the important stuff. And he impressed something very deep in me, that I’ve never forgotten. I’ll show you what I mean. One year, when I was a teenager, we were invited as a family to attend a canoeing trip on the Russian River in California. We were so excited. We donned our helmets and paddling gear and set off down the sleepy stream. One canoe was too small of course, to fit all five of our tribe. I may be the oldest, but both my brothers have me beat in the height and weight department, so we split up. Being the oldest, I captained one vessel, while my dad skippered the other of this rickety craft. My mom, not a particularly strong swimmer, rode with me. But that was going to change. We’d been given some instructions from the canoe company about which fork of the river to follow. Clearly, we missed something, because what we came upon next was nowhere on our map. As we rounded the bend, suddenly the serene landscape changed. The sense of quiet isolation on a gentle river went right out the door. We had paddled right into the wild whirlpool of a Nudist Colony. Naked people were everywhere: on inner tubes, on lounge chairs, on picnic tables. (There’s something deeply disturbing about naked guys eating fried chicken, by the way.) They were playing volleyball. The were flinging Frisbees. And just in case you’d missed all that, colonist after colonist were somersaulting into the river from the forty-foot rope swing strategically positioned to broadcast the camp’s location. And every one of them were naked a picked birds. My mother is a very modest person and she was instantly mortified. My dad immediately came to her aid. “Mom’s going to ride with me from here, boys” he directed. We paddled together quickly and my mother disembarked for Dad’s boat, just in time for our first meet and greet. Looking back, the sight of this teenage boy’s jaw hitting the canoe floor must have been pretty funny. I’d never seen anything like this before. And it wasn’t long before the first dude in his birthday suit came floating out to us. My mother was horrified, and honestly a little panicky. Why would this strange man from this strange place want to do such a strange thing? Mix that with a dose of terror from the thought of being spilled into the river and having to swim for her life. Instantly, came my father’s reply. “How about I part your hair with this boat paddle?” he threatened. “Nobody’s gonna be gettin’ in my boat today.” And with that we darted past the bewildered man, who looked like somebody had just prematurely blown out his birthday candles. It wasn’t bravado. I had every confidence that guy would have been wearing a boat paddle where his ball cap should have gone. My dad went on to challenge us that when we had a family of our own, the responsibility would fall to us. The truth is, as fathers, we can’t always control what’s around the river bend. We can’t promise that a freak on a flotation device won’t come looking to invade our space. We certainly can’t control the fact that we live in a chaotic world, filled with people and behaviors that are going to sully our scenic waterway from time to time. What we can control is whether we let it get in the boat. I thought my father was hilarious then, and I think it’s hilarious now. But beyond the humor of my mom getting splashed by that rope swing, lies the sober reminder of one dad to another. Always take up the standard to be bold on behalf of your family. If you don’t, who will? And the next time you see Crazy floating down the river toward you, get a good grip on that boat paddle. You may need to thump a knot on somebody’s head. That’s what a good dad is prepared to do. The older I get, the less I know. Can you relate? I don’t mean that I’m losing my ability to remember, although some would argue I should seriously address my Diet Pepsi addiction. I mean that the more I learn in life, the more I’m keenly aware of how much I have yet to learn. The more I discover, the more I’m cognizant of the very narrow boundaries of my understanding. The universe is vast; my grasp of it could scarcely fill a paper bag. I have endeavored to follow Christ for most of my life. I’ve admired Him and studied Him and marinated in His book again and again. I’ve spent a lifetime listening to people much smarter than me pontificate on all His manifold qualities. I’ve called upon Him in the darkest of nights and rejoiced with Him in the brightest of life’s blessings. I’ve travelled with Him through glories and graves, vistas and valleys. And all along the path, He has revealed Himself to me. The walk has been thrilling and enriching and life-transforming for the good. But the longer I walk, the greater the revelation that I’ve barely scratched the surface of Who He is. Gather up all I understand about God. I’d scarcely fill a paper bag. The Mountain of His power, wisdom, grace and grandeur are still an undiscovered country. And yet, in spite of all I do not know, I know His love. How can I know something that exceeds my ability to understand? The answer is: “I have no idea.” And yet we, mere babes, have the God-given capacity to know the Father’s love. But the revelation of God’s love lies not in our keen knack to sneak morsels out of God’s love vault. The reality is that our God desires to impart an understandable, experiential expression of His love to us. He intends it. Mountainous though His love is, He actively and eagerly delivers kid-sized pebbles to our paper bag. This side of His Holy Hill, a brown bag will have to do. We simply have no more capacity. But one day, we’ll look on the Himalayas of His love and eternally understand. One day, what we have known in part, we will know fully. But until then, I’m thankful for a God who lavishly and consistently delivers incomprehensible, yet completely understandable expressions of His love to my tattered paper bag. When I became a father, I started doing something that my dad always did. Isn’t it funny how that happens? You end up turning into the Old Man at some point. But in this case, it wasn’t an accident. I did it intentionally. It made an enormous impact on me, obviously. (Because now I’m inflicting it on my kids.) But it would be difficult for me to over-state how significant the expression of love, care, responsibility and value of the family name was conveyed in that simple phrase. Even as a small boy, I would finish my dad’s sentence. And you know what happened when I became a man? I remembered. Now, with my kids, I find myself wanting to communicate the same thing. I’m intentionally trying to express how much I love them and how much I care for them. I’m also being careful to inculcate in them the value of being a responsible person—to remind them that their name means something. I want to steep them in the notion that integrity is a precious commodity, and a scarce one at that. “You belong to Jesus, and to me,” reminds them both of their eternal value to God and of their earthly significance to Dear Ol’ Dad. I tell them this because I want them to know that they BELONG—and nothing could ever change that fact—for Jesus or for me. And you know what he did? 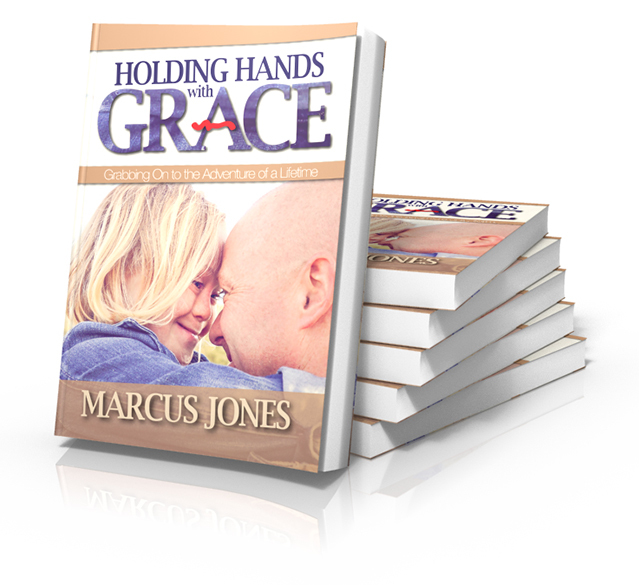 A little grin creased across his lips and he quickly grabbed my face with his little hands and replied, “Don’t forget who YOU belong to, Dad.” And with that he wheeled and went into class. If you don’t think you’re being watched by your kids, think again. Every little action and encouragement, every voice inflection, every look, it’s all being imprinted on the hearts and minds of the little people that follow you around. Be careful what you’re writing with your words and actions. They’ll quote it back to you someday, one way or the other. Make sure the chapters you’re recording are worth reading by the little boys or girls under your care. One of these days, they’re going to grow up. And they’re going to start writing their own pages and modeling what really matters to your grandchildren. And the loudest voice they’ll hear ringing in their ear—for good or for bad—will be yours. They’ll thank you for it some day. REACT: What expression of love has made the most significant impact on you? Leave a comment below. Try searching for a leadership book on Amazon some time. What you’ll find is a treasure-trove of some 100,000 book titles, all pushing their particular take on the mysterious keys to leadership. There’s plenty of books on the subject, a direct result of a hungry reading public, seemingly starved for it. There’s nothing wrong with leaders. I consider myself one. There’s nothing intrinsically bad about being a leadership learner either. The world needs better leaders. In fact, one could argue the world faces a crisis in the category–a global dearth of skilled trailblazers. That being true, perhaps we need those 100,000 titles. Or, maybe we don’t. Something’s broken in how we look at this leadership thing. Maybe our hunger to dig up bigger leaders has actually unearthed their darker angels. We’ve all seen the grizzly undercarriage of this locomotive. You may have been run over by it. Maybe you’ve done the driving. Either way, there’s no shortage of leadership horror stories for us to share with one another. What’s at the center of most citizens in Leadership World is the clamor to influence wider, build bigger and climb higher. It’s a drive to lead more people, get more production out of the resources around you, and become the bigger dog. There’s a lot of competitiveness in most leaders I know. We tend to treat people as commodities to be used, rather than gifts to be stewarded. Leadership can devolve quickly into emperorship. And God forbid two emperors start eye-ballng the same territory. The dog-fight that always follows, and the fur that always flies, will prove the better man or woman. The last dog standing always wins, right? Isn’t that the sub-plot of most leadership books you read? How do I win more? How do I accomplish more? How do I build my brand or my portfolio or my renown? But it isn’t working—in the long run. Short term victories are ending up in losing seasons for many leaders and the circles that follow them. Maybe we need a different paradigm. Maybe what we’ve been doing is building leadership with the wrong blueprint, the wrong model. Maybe, we need a different Book. Jesus is the most influential leader the world has ever known. His book is history’s best-seller, going away. But what He modeled in leadership left just about everyone in His circle scratching their heads. He said if you wanted to be great (in the real Kingdom), you had be a servant. He showed that real Lordship didn’t arrive on a white, kingly stallion, but on a lowly donkey. When people hurled insults at Him, He made no retaliation. When they made threats, He held His tongue. When given the choice of personal advantage or self-sacrifice, He always chose the humble path. He always subordinated His preferences to His Father’s plan. There was (and is) something compelling about the meekness of Jesus. He had all power at His disposal, yet restrained Himself. He exchanged the wealth of Heaven for the poverty of earth, all so He could give to you and me. He experienced loss, so you and I could win. And because He allowed Himself to be brought low, you and I are lifted up. Jesus drew up a different blueprint for real leadership. And it’s one that has stood the test of the centuries. Try it on for size. You can never go wrong by going low. When you and I put on the Christ-garment of humility and servitude and lead from that posture, what we will glean is the fruit that only His plan can produce. You’ll be set free to enjoy true generosity. You’ll encounter the freedom that comes from selflessness. Any other picture of leadership is just a warped facsimile of the Jesus-original. When you experience the counter-intuitive truth that your life is made better when you help other people win, you’ll discover what tens of thousands of the world’s books have failed to calculate: that there is richness and fulfillment in leading from bottom. As you follow the model of Christ, and take your personal descent into greatness, let hope rise, knowing that what awaits you is a reward you could never build for yourself. It’s buried beneath your feet as a leader. Dig down deep and lift the ones you’re leading along the way. Your personal greatness will be defined by how fully and how consistently you gave yourself away. Because when it comes to leadership and influence that really matters, you can never go wrong going low. My family and I took a trip to Palm Springs not too long ago. We got a good deal on a timeshare and quickly learned why our vacation was considered “off-season.” The temperature was hot—really hot. It was north of 110 degrees hot. But we immersed ourselves in the pool, got a steady diet of air conditioning and had a great time. One afternoon, we decided we really wanted to beat the heat. We had heard from some friends about a cool excursion called the Palm Springs Aerial Tramway. Everyone we talked to said that this daytrip was a must. We gathered up the kids and headed to the Tram Base Station a few miles away. Elevation: 2000 feet. Temperature: 100 degrees. As soon as we arrived at the bottom of the mountain, my wife began to renege. What had sounded like a great idea to her earlier in the day, now melted into a malaise of nausea upon seeing the nearly vertical grade we were about to climb. You see, this tram ride just so happens to be the world’s second steepest tramway. My children were undeterred. Turns out, peer pressure’s got nothing on “Kid Pressure,” and my wife was feeling it. All four of our kids jumped and squealed with excitement as we neared the entrance. There would be no going back for Mom. She emboldened her faith by examining the cable display and counting the steel lines that would hold our lives in their hands. As we lifted off from the base station, the excitement only grew. We seemed to soar above the valley floor, higher and higher. The views were incredible; the sheer rock face was incredibly intimidating. Up, up, up we climbed. As we did, you couldn’t help but notice the breathtaking views. And we began to notice something more subtle wafting through the open windows: cooler air. The higher we went, the cooler the air became–the more magnificent the vista grew. When we arrived at the summit ten minutes later, it was as though the entire world had changed. What we had left at the bottom was sand and scrub brush and molten temperatures. The top greeted us with a forest of trees and trails and greenery from out of nowhere. Oh, and it was 35 degrees cooler too. Elevation: 8500 feet. Temperature: 65 degrees. We spent the entire afternoon exploring and investigating trails and rock formations, plants and animals. I’ll be honest, we spent a fair amount of time just throwing rocks too. But as we loaded up in the tram to make our descent to the base station, I considered my life. This little, ten-minute ride had reminded me that even when I find myself in the place of difficulty, the place of desolation—the desert places, I need to believe something. When life brings the heat and I’m standing in the furnace of my pain, I need to hang on to something. I need to recognize that scrub brush and heat are naturally occurring elements of the valley, especially the lowest ones. But if I’ll look up, maybe I’ll see a place that looks very different. The higher hope rises, the more beautiful the perspective. It took the second-steepest tram ride in the world to bring that into bold detail for me. My life is a lot like that tramway. It’s hot in the valley. But the higher hope rises in my life, the more beautiful my perspective becomes. That’s why I need to live life looking up. There is a vista, sometimes right above my head, where I can see farther. There is an outcrop, often just above the horizon, where cooler winds have soothed the searing heat. There is a mountain that Hope built. 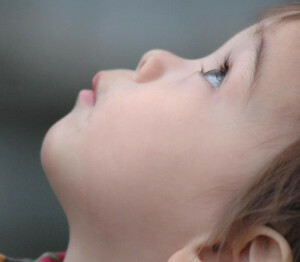 I need only look up and see it. Christ, my Hope, stands on high places, calling me to lift my countenance. The higher I allow His great hope to rise in my life, the more refreshed, the more powerful, the more beautiful the perspective. Comparison is the enemy of life’s most precious commodity: CONTENTMENT. Left unchecked, words like envy, boast, greed, pride and jealousy will build such significant pressure in our lives that we’re one spark away from a discontentment brush fire. So how do we overthrow their power? How do we reject what seems so natural for us to indulge? How do we conquer combustible comparison? All over the world, human beings are cherry-picking situations. While life is made up of good and bad, strength and weakness, upsides and downs, we allow our eyes to tell us the lie that you can somehow have the cherries of another person’s life without the pits. If your weakness is envy in a relationship (like your marriage), run from the things that tend to trip you up. For most of us, that means being careful what you allow yourself to tell yourself. Listening to those lies from your eyes will burn you every time. What is risky for you? If it’s materialism, limit your time at the mall—watch it at Walmart. If you struggle with your own vanity, choose modesty. 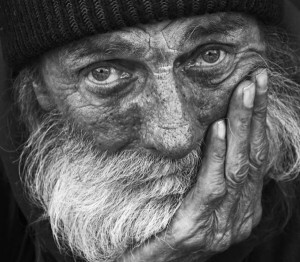 If you put undue value in your bank account, give to someone in need. We have to starve the comparison enemy in our life in order to feed contentment. If we don’t, contentment will never grow. Take the back so someone else can have the front. Give so someone else can receive. Go without so someone else can gain. Your life will be better when you help other people win. Nothing breaks the back of combustible comparison quite like stopping to appreciate all that you already have. This isn’t just a Thanksgiving exercise. This is a life-long decision. Giving thanks for what we’ve already received helps us value not only the past, but the present. Beating back the brush fire of comparison will lower the combustible pressure in your life and allow true contentment to rise. 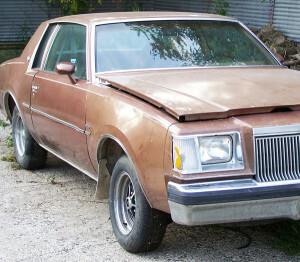 My first car was a 1978 Buick Regal. What was yours? I didn’t get the keys to this bad boy in ’78. I came of age in the late 80s, which meant my first ride had some serious mileage on it. The headliner sagged onto your head when you rode in it. The door latches didn’t really work. The window cranks had broken off. At one point, I actually had to tie the driver and passenger doors together with a rope from the inside, roll down the window and get in Dukes of Hazard-style. But it worked. It got me where I needed to go. And it was a gift to me from parents who were doing their dead-level best to give me what I needed. To further complicate my transportation self-image, I was a scholarship kid at a private high school. That meant I was a poor boy in a rich man’s world. Every time I pulled into my parking place at school, I stood out among a sea of red sports cars and convertible Beemers. But rather than appreciate my car for the first taste of independence and freedom that it was, I compared it to what other kids had and I was discontent. We all want to be happy. But few people recognize the primary enemy of their own contentment. It’s a crafty little explosive device that creates so much pressure that your life can become downright combustible. That’s what I did with my old car. I didn’t compare my best to their best: my parents for example. I picked what I thought was my worst. Envy invades my life when I compare my junk to someone else’s jewels—my jalopy to someone else’s Jaguar. When we see our “have-not” in another person’s “have” we fall prey to the enemy of envy. Year by year, the holiday shopping season creeps earlier and earlier. Retailers, once satisfied to begin the Christmas crush on Black Friday, have begun to invade Thanksgiving itself in order to satiate the materialistic appetite of America. When I compare my lack to your abundance, greed threatens to detonate my contentment. This was me over the past few years as a San Francisco Giants fan. When you win two out of three World Series Championships, it starts feeling easy. You start believing you’re entitled to it. The problem is that pride always precedes a downfall (Prov. 16:18). And the Giants proved that in 2013, finishing sixteen games out of first with the same World Championship roster. Every person I know desperately wants to be content. Recognizing the enemies of your greatest desire is essential to beating back the brushfire of deadly comparison. Which is your biggest pressure point? Share a comment below. I don’t know anyone who enjoys being hungry. I know I don’t. In fact, most Americans have made the pursuit of food one of the biggest foot races in their life. We run to food every chance we get: for comfort, for celebration, for socializing, for fun. We don’t like being hungry, so we slather that aversion with super-sized servings of just about everything. Judging from the obesity rate in the U.S., now at nearly 36 percent, the run FROM hungry is about all the exercise we get. But more and more, right under our cuisine-sniffing snoots, an altogether different race is being run. Today in San Diego, as many of 30% of the households can’t make financial ends meet each month. That means that 640,707 people are making the no-win decision between paying simple household utilities and buying groceries. One in four children are food insecure. They’re hungry, and there’s nothing they can do about it. A few years ago, my wife and I stumbled across a Thanksgiving morning event in downtown San Diego called: “The Run for the Hungry.” It’s a 5K/10K fun run through the streets of the Gaslamp and East Village districts of the center city. The proceeds go to support the efforts of The San Diego Food Bank, which serves nearly sixteen million meals a year to people who need them. Physical hunger, especially the sort experienced by so many struggling people in the city center, is a blight that we must stand up against. It’s basic, it’s solvable and everyone can do something. So Thanksgiving morning, I will…do something, that is. No matter what challenges or comforts life has dealt you, your heart is plagued by a different sort of hunger: a soul craving. You were custom-made with an intrinsic appetite for something bigger than yourself. You were crafted with a God-thirst right at your very core. You try to quench it in every conceivable way. You feed the appetite with every sort of delicacy. But it’s a hunger that can only be satisfied by the Life-yielding Bread of God. “Am I hungry?” I ask myself, “Hungry enough to run for it?” Am I thirsty enough to reach for the Living Stream? Has a longing for something bigger—something God-sized—consumed me enough that I’ll stop at nothing to possess more of Him? Maybe your next move is to step away from the super-size-me steeplechase and forgo a meal or two for a spiritual Q&A with God. In fasting and prayer, allow your physical hunger to sharpen your spiritual dependence on Him.